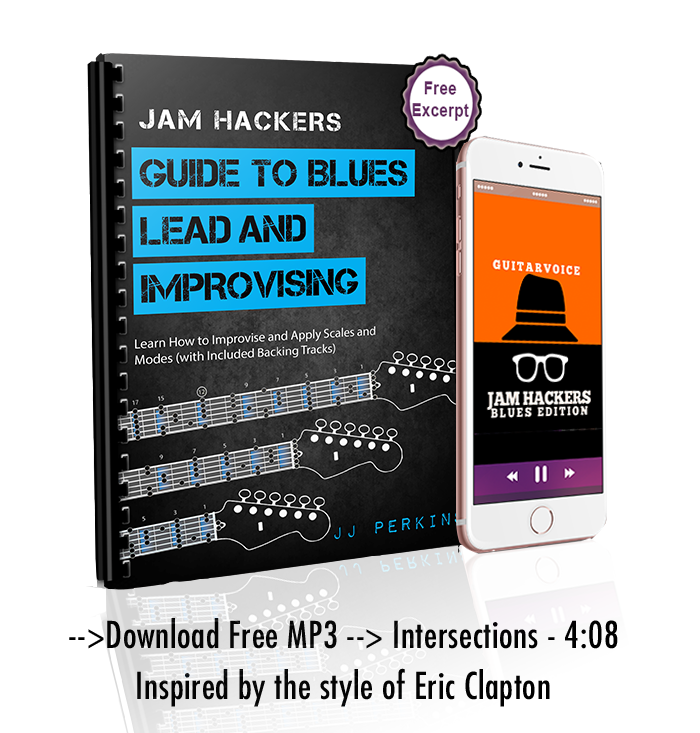 Learn how to blues solo with your 20 Pro Blues Licks in G.
This purchase includes the pro 26 page guide including 20 blues licks and inspiring quotes by legendary bluesmen. Play along with the many free backing tracks at GuitarVoice.com! These licks will help you know where to play in the given key. This is step 1 in learning to improvise and play lead – playing in the given key. Learning to play these licks in the key of G will prepare you to improvise on an insane amount of popular songs. Mastering solos this way will also get you ready for the next level – soloing over the changes. Learning scales is good, but it won’t teach you how to play blues with soul. Each lick is shown as tablature and also standard music notation. The best part is the licks will work magically with many of the free backing tracks available on GuitarVoice.com. Develop your ear by playing licks that fit into backing tracks. 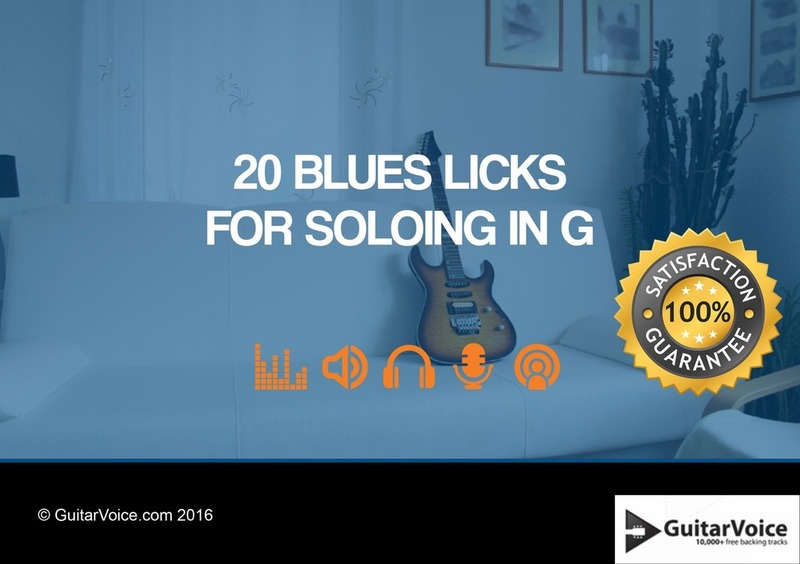 Use the licks to develop your own blues solos and lead guitar parts. Try playing the licks with the timing suggested, or go freeform and reinvent the licks with a new rhythm. Licks vary from easy to difficult to challenge your skills and give you new ideas. Bending and sliding the notes in these tabs is highly recommended to develop your blues soul. Learning and playing these licks will help you know where to play on the fretboard for a given song in the key of G (or G Major). Why practice endless scales and modes when you can start improving your skills and have fun soloing – right now! 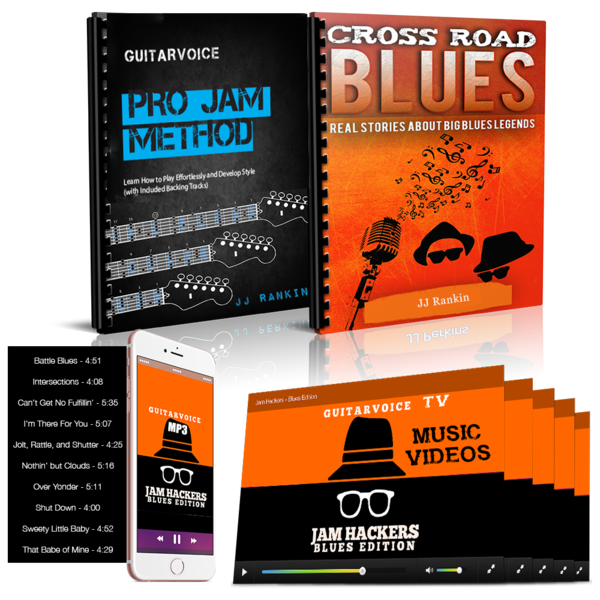 Buy the 20 Pro Blues Licks and if for any reason you’re not satisfied, let me know and I will immediately activate your full money back guarantee.